Australian teen blogger with a world to explore. I'm back again! And this time, it's a bit of a different post, again. Even though it still has some of my photography, I have added a bit of style to it. A few weeks ago I went to Melbourne and naturally, I bought plenty of things, just enough to fill the insides of my suitcase, which my excuse to my mother was 'I didn't want things rolling around inside'. She totally loved that. Here is my little Melbourne outfits, a total of four of them, some with accessories that I already had. The above outfit is made up of pretty simple items, and it's super comfy. The top and denim pants were purchased in the lovely place of Melbourne. The top was on sale for $10 from Cotton On and it's super soft and light, and thankfully the white isn't dominant, because with my insanely white skin it would look a bit ridiculous. For this outfit, I added the bright blue denim shorts which I got on sale for $5 at H&M which is probably the most amazing store known to man kind. It was the first time I had ever been into one of their stores and I was completely overwhelmed by the hugeness and absolutely gorgeous clothes in there. It's not too expensive, and the cheaper items are actually good quality for what you're paying. I would 100% consider moving to Melbourne just for this store. This is not an advertisement I promise, I just love it that much. The shoes in the outfit I bought for $15 from Target in Brisbane, and the sunglasses were a present from my Brother which after some savvy internet use, I found they were $40. Thanks brother! It's the perfect outfit for shopping, going to lunch with friends and I'll most likely be wearing it to tafe a few times this summer. And the top is even perfect for when it gets a bit colder, as it sometimes likes to do in Brisbane. It'd be greatly appreciated right now. The second outfit is a bit more dressy, with a blue peplum top, which I purchased from Dotti for $10. It was reduced because it had some foundation on the neckline. That came out in the wash and I saved about $20-$30. Score! The jeans were bought from Just Jeans in a deal of 2 for 1 so I bought two of the same colour and design at the price of $80. I'm a good bargain hunter I guess. The purse I also bought in Melbourne, is Kate Hill and of course I got it on sale. From $40 down to $21, I was pretty happy. It's pink, it's got loads of card space for my loyalty cards I rarely use and it's freaking Kate Hill. I love Kate Hill. The shoes are from Forever New in Brisbane, which were originally $60 but I got them for $20. What can I say? I have a nose for bargains. I just end up where all the sales are. It's the perfect outfit for a first date, going to the movies with friends, or just to wear because it is so darn cute. This next outfit is using the jeans again, and this time I have paired it with a top I bought from Myers, for $15. I love their sales. It's apparently white and navy (according to my mother) but I see it as white and black. Anyways, it's a super breezy top and paired with the heels I got from Rubi Shoes in a deal of 2 for $50, I was super happy! I had seen heels similar to these but with wedges at Betts For Her and of course they were sold out in my size. But these are super comfy and not too tall. But of course heels just don't seem to hurt me. I'm pretty happy with that! It's perfect for going out to dinner, and without the heels, it'd be a great outfit to wear just hanging around at home. This outfit is made up of all things Melbourne. The shoes are the other pair from the deal in the above outfit, and are super comfy. I walked around Melbourne for about 5 hours while wearing them and I have no complaints. They also sounds really business like when walking on cement. Makes me feel important. The scalloped denim shorts were $20 and are my new true love because wow they're just adorable and the colour of the denim goes super nicely with my skin, without washing me out. Perfection! The top is from Dotti, which I bought for $15, saving $10. Not a huge saving but it's such an adorable top and the knit is so nice and soft so naturally I bought it. Do not go judging me for my impulse buys. If you were there, you'd buy it too. Another perfect outfit for lazying around, and would be a good look for tafe, without the heels, because let's be honest here, who on earth in the right mind wears even the tiniest of heels to tafe/uni? The last outfit from Melbourne is probably my favourite because I've worn this ensemble many times and I have absolutely no regrets. The top I bought from 'T Bar' in their 6 for $40' deal and thankfully my Aunt and mother love that shop and bought other tops for themselves. The top in the deal was about $6. It's a simple black crop with off the shoulder sleeves. I usually dislike showing a bit of my stomach, but after a few of my friends complimenting my flat stomach I decided to give it a go with showing a tiny bit of stomach and yeah, it worked nicely with these shorts. Heck yeah, these super cool pink bottoms are actually shorts, yet look a bit like a skirt. Is it cool? Uh duh, of course it is! It wasn't even on sale, so of course it's awesome! The only painful thing about the bottoms is the ironing. It's so frustrating, but if you get it right, it looks pretty sweet. The shoes were from Forever New, as spoken about in one of the other outfits and the necklace was a present of a former friend who we shall not talk about. She changed. It's a perfect party outfit, yet I'm of course going to wear it everywhere because it's super comfy and makes me feel good about myself, and that's exactly what clothes should do. There we go! 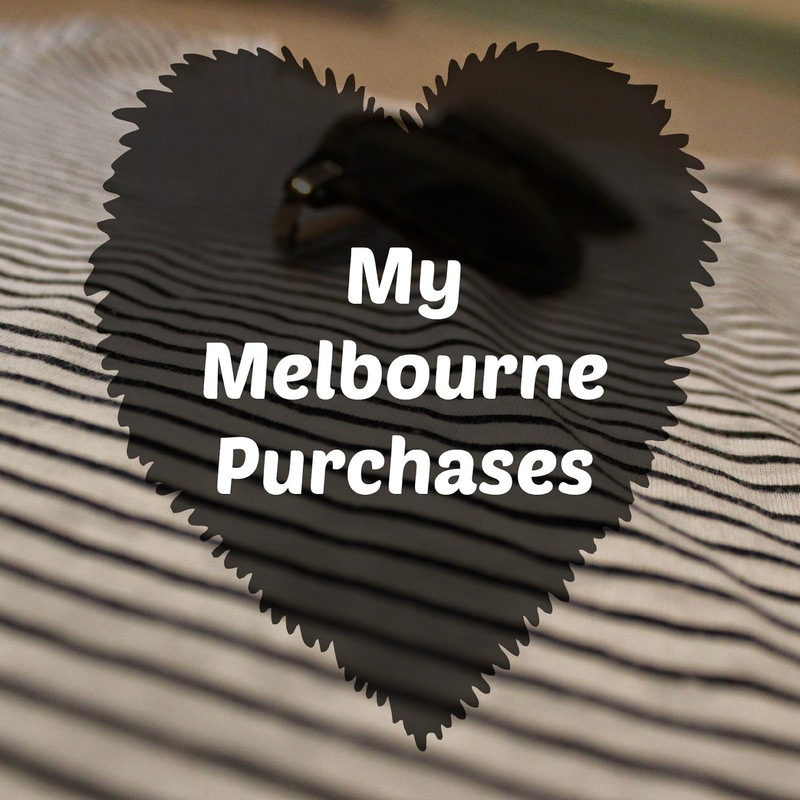 A few weeks overdue, but those are my Melbourne Purchases, and I do love them all individually and equally. And also I love Melbourne.